Jimmy Butler was a late scratch from Monday’s game against the Bucks, but the Bulls were able to overcome their missing star on the wing with smart ball movement and excellent shooting. While Butler’s re-injury is both disappointing and frustrating (another great moment for the Bulls’ training staff), the team is finally rounding into form. Pau Gasol found a way to contribute to the win on a night where he couldn’t find his shot. The big Spaniard scored just 12 points on 4/14 shooting, but he blocked five shots, grabbed 17 rebounds and dished 13 assists to round out his second triple double since the All-Star break. Gasol did an excellent job finding cutters while working from the high post. Several times, too many Bucks defenders had their eyes on Pau and he made them pay for their mental mistakes. Pau wasn’t the only generous Bull on the court. Derrick Rose and E’Twaun Moore had seven assists each, and the team overall assisted on a season-high 35 of their 39 field goals. The Bulls are currently 15th in the league in assist percentage, something to be expected with two ball dominant guards capable of creating for themselves. 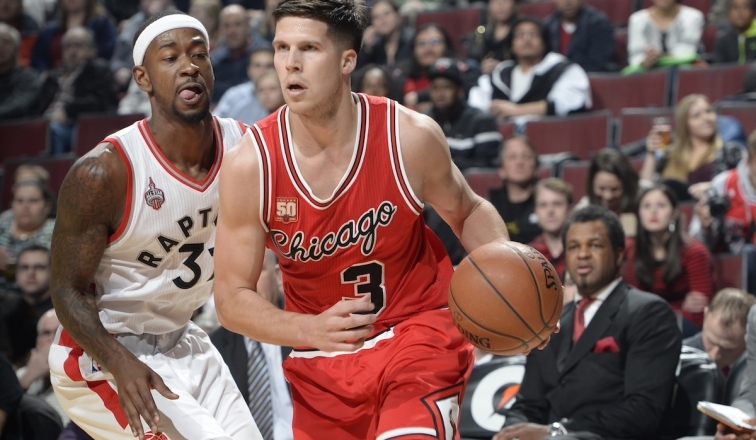 But with Butler unavailable, the Bulls utilized smart passing to cover up a talent deficit. A lot of that smart passing led to wide open shots around the perimeter. Mike Dunleavy in particular cashed in on an uninspired defensive effort from the Bucks to close out at the three point line. Dunleavy scored 18 points on 7/9 shooting and 4/6 from three. My favorite thing about Mike Dunleavy is the way he runs to his spot above the break in semi-transition. Sometimes he sprints there when the Bulls have numbers. But the best is when he sort of saunters up to the line after the lead ball handler has forced a switch on the fast break. The uncovered Dunleavy times his arrival to his spot perfectly, always catching and shooting the ball in perfect rhythm. Derrick Rose carried the scoring load for the Bulls with Butler missing and Pau missing shots. Rose finished with 22 points on 9/18 shooting. Derrick knocked down a pair of three pointers and was effective attacking Milwaukee’s interior, especially when Greg Monroe was in the game. Rose was a team high +22 in his team-high 38 minutes. Part of the reason Rose had to play so many minutes was because, in addition to the absence of Butler, Aaron Brooks left the game midway through with pain in his knee. Brooks has been mostly horrible this season, but the Bulls really missed having another option at point guard. Rose is not built to play that many minutes on a consistent basis, and if Brooks is going to miss time, this team is in trouble. 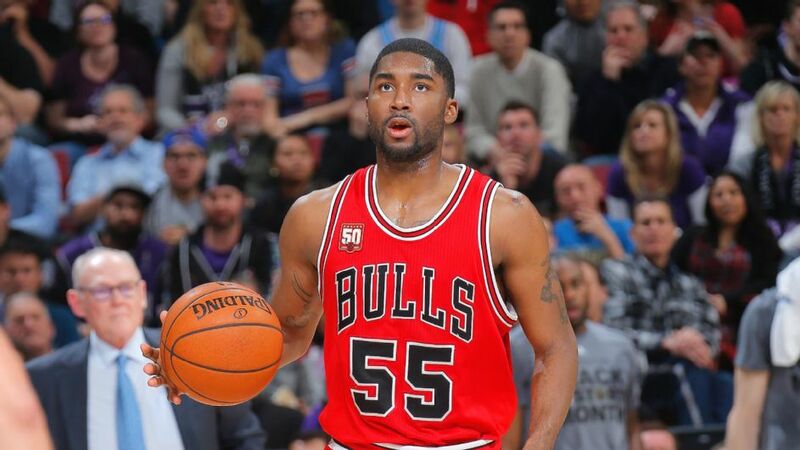 Having said that, E’Twaun Moore continues to impress in his increased role. The Boilermaker scored 16 points on 6/11 shooting. He dished the aforementioned seven dimes, and did not commit a single turnover in nearly 36 minutes on the court. Moore has stepped up for this team in a big way, and is in line to cash in during this crazy upcoming summer. The Bucks are all kinds of weird and intriguing. Their size and versatility on the wing is frightening. Giannis Antetokounmpo acted as defacto point guard much of this game and wracked up 10 assists. Jabari Parker flashed some elite speed and athleticism for a power forward on several strong moves to the hoop. Khris Middleton is a dynamic offensive player, able to shoot, drive and dish. If this team ever finds a suitable point guard and center to compliment the core on the wing, everyone is in trouble. Coming up: the Bulls head into San Antonio on Thursday for a matchup with Kawhi Leonard and the NBA’s second-best squad. Jimmy. G. Buckets. IS BACK. The hype machine is real! After missing eleven games due to a leg injury, leaving the Bulls 3-8 in his absence, Jimmy Butler came back with a vengeance, scoring 24 points, grabbing 11 boards, dishing six assists, shooting 11-12 from the free throw line, and posting a team-leading +28 in just under 34 minutes, along with his patented passing-lane steal for a jam. Butler’s aggression and excitement to be back on the floor resulted in fouling out for the his first time in his NBA career, but it came with just two and a half minutes left in the contest, coupled with a huge ovation from an appreciative crowd. It did not go unnoticed that Jimmy also played lock-down defense on James Harden, one of the most prolific scorers in the league. Harden ended with 36 points, but according to ESPN Stats and Info, only six of those points were scored when Butler was guarding him, shooting just two for six in that time with three turnovers. The jarring between Derrick Rose and Patrick Beverley was fun to watch, and we need more of that in the NBA. Apparently the refs didn’t know that Beverley and Rose grew up playing against each other in Chicago, and awarded them double technicals. Derrick on the sparring: “Pat (Beverley), he lived in my house in the summer. No cursing; fun out there; the league is not used to that, I guess.” Derrick was having fun out there, too, finishing with 17 points and nine assists. Note-a-BULLs: Nikola Mirotic makes his return after being sidelined with appendicitis, notching seven points and adding two key three balls. Aaron Brooks didn’t play a single minute, possibly as a direct result of his ejection against the Magic on Wednesday. Tony Snell also did not play – coach’s decision. Coming up: The Bulls host the Milwaukee Bucks Monday night. The Bulls are currently 30-30, a perfectly average record. Unfortunately, they haven’t played quite as good as that record suggests, as a recent run of wretched play has dragged Chicago’s net rating down to -1.5, good for 18th in the NBA. They now sit a half game out of eighth place in the Eastern Conference, on the outside looking in for the first time in months. As we sit at the third quarter mark of the season, the DRaT crew decided to once again take stock of the franchise. (You can find the Quarter Season Breakdown here and the Midseason Breakdown here). Fortunately for the Bulls (depending on your perspective), they should have plenty of juice to make a push as the team gets healthy. Jimmy Butler is set to return this weekend from a scary knee injury and should instantly boost the team on both offense and defense. Nikola Mirotic is still making his way back from a nightmare appendectomy, but all signs point to a return this month. While the Bulls have been one of the league’s worst teams of late, there’s also been a few bright spots. Derrick Rose continues to look excellent, easily getting into the paint and converting a solid percentage around the rim. He’s also maintained strong efficiency on his newest weapon, the bank jump shot. While Rose’s inability to stay completely healthy can be quite frustrating, he’s on place to play in nearly 70 games this season. That’s awesome. Jacob Bikshorn is going to tell you about Doug McDermott‘s surge; Jared Wyllys has the impact of Jimmy Butler’s absence; Drew Hackman digs into the return of DRaT favorite Mike Dunleavy; Jason Schwartz analyzes the emergence of E’Twaun Moore. Enjoy! Since we last checked in, things have not been going well. Injuries, lackadaisical defense and an improved Eastern Conference have the Chicago Bulls on the outside looking in to the playoff picture. But if you carefully sift through the rubble of this season, you will discover one glimmering ray of hope. The Bulls front office pushed all their chips to the middle of the table on draft night in 2014, and over the last twenty games, it’s starting to look like that bet might pay off. After a disappointing rookie season and a discouraging start to his sophomore campaign, I was ready to throw in the towel on Doug McDermott. But the developments over the last twenty games have me believing that Doug can grow into a potent offensive weapon. The absence of Jimmy Butler has forced everyone to shoulder a bigger offensive load, and Doug has answered the call. McDermott has scored double figures in each of the last seven games and nine of the last 10. Prior to the All-Star break, McDermott had a 16.1% usage rate. In the eight games since, McDermott has raised his usage to 20.1%. An increase in usage is often accompanied by a decrease in efficiency, but thankfully that has not been the case with McDermott. For the season, McDermott’s true shooting percentage is 55.1%. In his last 10 games, Doug’s true shooting has jumped to 59.4%, a number that puts him in the upper echelon of NBA wings. McDermott has actually seen his three point shooting slip just a bit during this prolonged stretch of effectiveness. He’s shooting over 41% for the season, but just 38% in his last ten games. So how has Doug managed to increase in true shooting percentage? Before the month of February, only 28.5% of McDermott’s field goal attempts were dunks, layups, hook shots or bank shots. In that same time frame, Doug only shot 51% on these type of shots. But, per NBA Savant, 33.8% of Doug’s field goal attempts have fallen into these shot categories and the former Creighton star is scoring on 63% of these attempts. I would be lying if I said that I watched much of Doug McDermott in college, but there’s no way he gained his reputation as a prolific scorer by standing in the corners for four years. Forcing McDermott to be nothing more than a floor spacer is an improper use of his skill set and severely limits the impact he can have on the game. Doug already has a well established reputation of being a knock down shooter. Now, he’s using that reputation to open up other parts of his game. McDermott has become a smart and dangerous cutter and has greatly improved his finishing skills in the paint. This play in particular highlights the full Doug package. He notices his defender overplays the three point threat, makes a smart cut, catches the ball on the move and finishes a reverse and-1. McDermott still has a long way to go in other aspects of the game. He is still a total defensive liability and is on pace to record the lowest block and steal total ever for a rotation player. But offensively, Doug is developing into a dynamic player able to hurt a defense multiple ways. I don’t think many of us had grand visions for the Bulls’ success this year, but missing the playoffs in a league where so many teams get in would be unexpected. Much can change in the next six weeks or so, but even if they ultimately sneak into the playoffs, it’s difficult to envision any kind of real success at that level. A lot of this is just the natural consequence of a new coach with the same flawed roster of last year, but so much of the team’s philosophy seems to have shifted. Once known for its defense, they are routinely giving up over 100 points, and even allowing teams to shoot franchise records (nearly 70%!) from the field. They haven’t been helped, though, by the recent absence of Jimmy Butler. In the grind of midseason, to lose Butler is very hard to recover from. They have gone 4-8 without him, but fortunately, Jimmy is expected to return for Saturday’s game. Seeing them without Butler probably exposes one of the major flaws of this team as currently constructed: They lack depth. Gone, truly, are the days when the Bulls’ “bench mob” could come in and handle a game in lieu of the starters. We see perhaps flashes of what used to be there, but it’s ultimately gone. 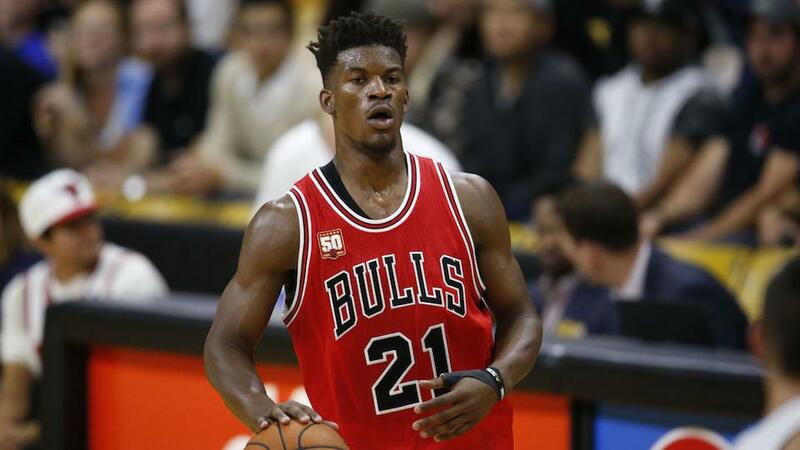 The Bulls now depend on Jimmy to be Jimmy for the most part. Butler leads the team in scoring and is just behind Derrick Rose in assists per game. He leads the team in steals per game. Even with his extended absence, Butler is tops in total scoring by over 100 points, and in total steals, it’s not even close. He and Pau Gasol lead the team in VORP, and Butler’s PER is second only to Gasol. Jimmy Butler is just crucial to this team having any kind of success. He’s the team’s clear best player on both ends of the court, and they’ve been a legitimately awful squad in his absence. Let’s hope Jimmy’s return gets the Bulls back on track. #THERETURN. It’s a moment Bulls fans have been waiting for all season long. (Nevermind the fact that #TheReturn has been overshadowed by injuries to Jimmy Butler, Joakim Noah, Nikola Mirotic, sporadic Derrick Rose soreness, and a mediocre team…) IT’S #THERETURN OF MIKE DUNL3AVY! The man, the myth, the legend, the 35 year-old veteran who came to Chicago to win a championship and who found himself out for half of his second season with the Bulls recovering from back surgery. Now, he returns in the middle of a team fighting for the eighth playoff spot. Since Mike’s return, they have gone 3-8, have allowed 100 or more points in all of those contests, and have been sliding out of relevance. Fortunately, for him, and for Bulls fans, the correlation here does not translate to any meaningful relationship due to its coupling with decimating injuries to several of the top Bulls players. Mike’s minutes have been understandably reduced, averaging just 21.6 MPG compared to an average of 30.3 over the last two seasons. With only 11 games under his belt this season, and in just about 200 minutes, we’re looking at a small sample size. Nonetheless, according to Basketball-Reference.com, Dunleavy is performing better than his career averages in a few important categories. Most notably, Mike is shooting 47.1% from three point range, compared to 37.7% career – lights out – and, he’s attempting a higher rate, at 5.1 per 36 minutes over his 4.5 career. He only gets to the line a couple times per game, but has hit 85%, over his 80% lifetime. In digging into some of the advanced stats, Mike’s PER is slightly up this year from last, along with ORB%, and USG%. His stats in other areas have suffered as a result of the lack of surrounding talent, but the numbers are encouraging for a player whose job is to provide spacing and a three point threat. 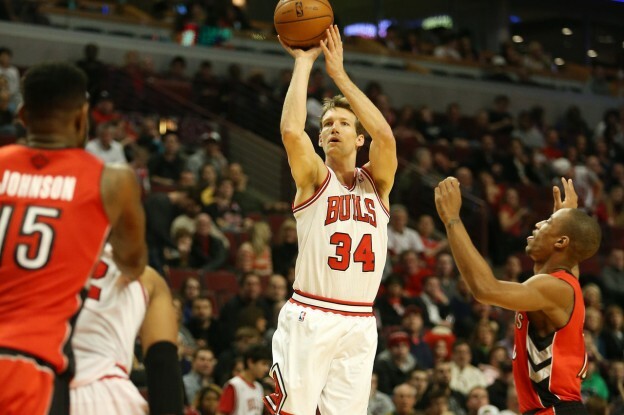 The things that Dunleavy brings to this Bulls team – grit, savvy veteran play, off-the-ball movement, and length on defense – are qualities that Bulls fans can enjoy night in and night out. And since his numbers are looking better this year than last in some key areas, the Dunleavy X-Factor will start to peak when Butler returns to the starting lineup on Saturday. It couldn’t come at a better time, as the Bulls make one final push for a good playoff spot and try to show the league that they’ll still be a relevant force come April 16th. With the Bulls free-falling out of the Eastern Conference playoffs and countless injuries to the first team, it has been hard to find positives in this mostly miserable season. However, over the past month, journeyman guard E’Twaun Moore has been just that, a ray of light trapped in a dark and gloomy cave. Moore had himself his best month in his NBA career this past February, when he averaged 13 points per game on 48 percent shooting. Moore’s career average is just five points per game on 42 percent shooting. But he has found some confidence given the increased minutes he’s received. These minutes are due of course to injuries to the likes of Jimmy Butler, Derrick Rose, and Nikola Mirotic over the last month, but the reserve guard has taken his opportunity and ran with it. Moore is much smarter with the ball than Aaron Brooks, and is much more competent on the defensive side of the ball than his diminutive counterpart. The Purdue alum will never be a star in this league, but the Bulls have needed consistent backcourt depth for quite some time now. With Brooks struggling with his shot and his other usual short-comings, Moore has been able to wrestle away some vital minutes from the veteran. He is an unrestricted free agent at the end of the season, and GarPax would do well to bring him back at a bargain price. Finding a backup point guard that can take care of the ball and score on occasion is very important for a contending team (even if the Bulls aren’t exactly that at this point). If nothing else, Moore is a good example of how Hoiball is supposed to be run. Moore pushes the pace when he sees the opportunity, and doesn’t pass up open looks, even if early in the shot clock. His ability to understand what Hoiberg wants is his best quality. In a rarity for the Bulls, they actually seem to run some semblance of an offense when he is in the game. As opposed to the chuck-it-up Brooks, or the drive at all cost Rose, Moore focuses on ball movement and finding empty space on the floor to attack. Whether he sees significant playing time going forward once the Bulls get healthy remains to be seen, but they have to be thankful for the second round pick who kept them in playoff contention when so many others on the squad lacked energy and intensity.